The quartet of musical storytellers and rock supergroup The Good The Bad And The Queen are making a long-awaited return to live performance as a real treat to end 2018. 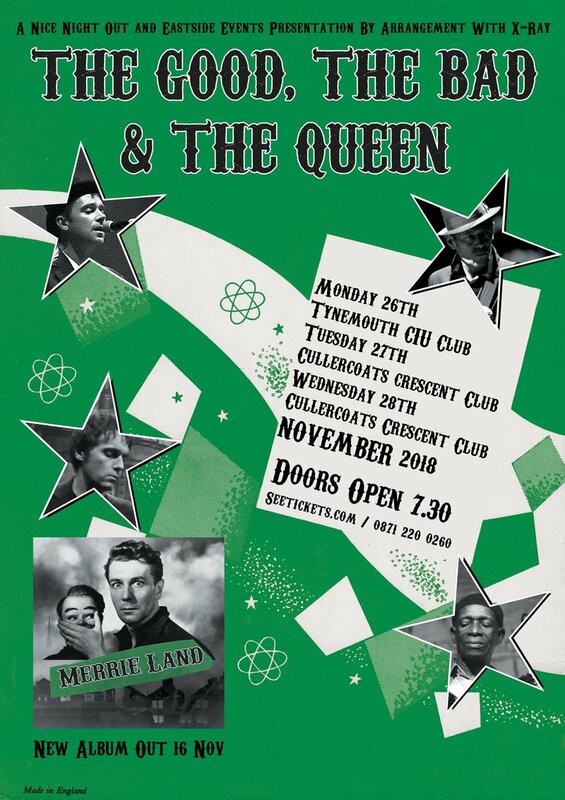 In preparation for shows in London, Glasgow and Blackpool, they’ve announced three intimate warm up shows at Tynemouth CIU Club on Monday 26th November and Cullercoats Crescent Club on Tuesday 27th and Wednesday 28th November, with less than 100 tickets released for each. Comprising of Damon Albarn, Paul Simonon, Simon Tong and Tony Allen and producer by Danger Mouse, there’s a real musical pedigree to the alternative art rockers. It’s hard to believe it’s been a decade since their eponymous debut album, but they’re back with new release Merrie Land and 10 belting new tracks. Tickets are sure to sell quick for these shows, and they go on sale at 9am on Wednesday 7th November. You can pick them up at these links here.